In Gear! Oakmoss Shaving Bar Home | About Us | Opportunities | Sponsorships | Contact Us! In this week’s In Gear Review, we had the privilege of experiencing the Oakmoss Shaving Bar from Scum Soaps. This shaving bar is a nod in the direction of ‘old school’ style mug-and-brush shaving techniques with a modern flair that makes it useful for guys who shave with straight razors or disposable blade razors. See what the Handmade Men team thought about this shaving soap right here! Since shaving became a daily ritual, shaving soap has been the favored way to lubricate the skin, hydrate it, and cut down on razor burn and rash. Because soaps are made from oil, they make the perfect product for giving your skin just what it needs whenever you shave. Shaving soap can be used with a straight razor, safety razor, or disposable razor – and you can use it perfectly in the shower or at the sink. Grab a mug or soap dish to hold your shaving soap, and if you’ve never used a shaving soap brush this is a great excuse to get one! From the moment the Oakmoss Shaving Bar arrived in the mail until it got put to the test with a shave, we were thrilled. The fragrance is amazing – a light and energizing moss, forest, rain, and ‘clean’ combination that made the perfect statement for a shaving product. 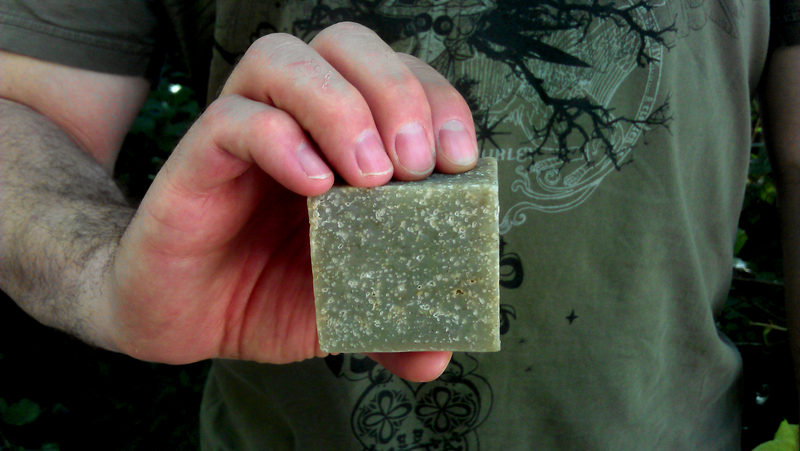 The texture of this soap is far more dense than you might expect. It’s clearly meant to last, and it’s packed with nourishing oils and various types of clay that help soothe the skin, keep it hydrated, and make it happy with even the closest of shaves. The lather is something to comment about. It’s light, stays in place, and keeps the true fragrance of the Oakmoss Shaving Bar alive. Various Handmade Men team members tried the soap at the sink and in the shower with perfect results. The lather stayed where it was put and seemed to be something the skin was eager to work with which is always a good sign! Post-shave skin is smooth, hydrated, and happy. Who could ask for more? 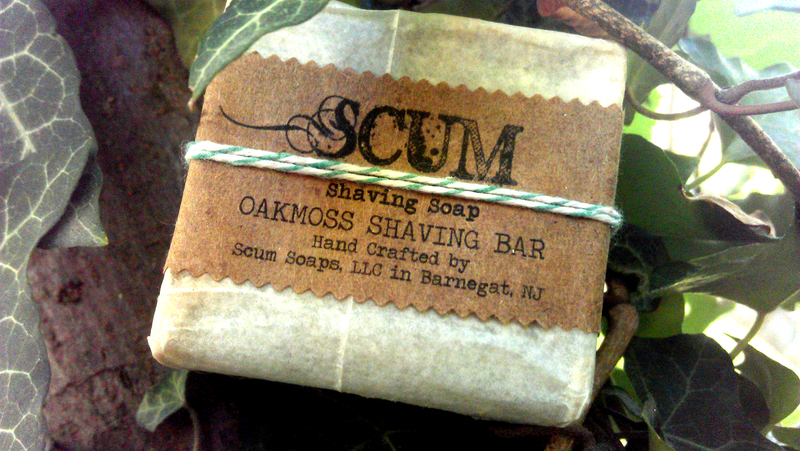 The Oakmoss Shaving Bar from Scum Soaps is a definite win. From its clean masculine scent to the way it leaves your skin feeling after use, this shaving soap is a cut above the rest! The cost for the Oakmoss Shaving Bar is super affordable and beats out many of the ‘high end’ chemical-filled store alternatives. Remember that you’re getting quality ingredients, handmade attention, and true craftsmanship in every bar! 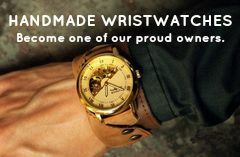 If you already know the value of artisan body care products, this should be your next purchase. If you’re just finding out the many reasons why artisan, handmade, and small batch products are a far better choice than their mass-produced alternatives – this is a great first experience! 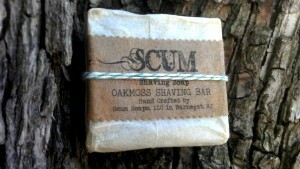 and other great items from Scum Soaps! 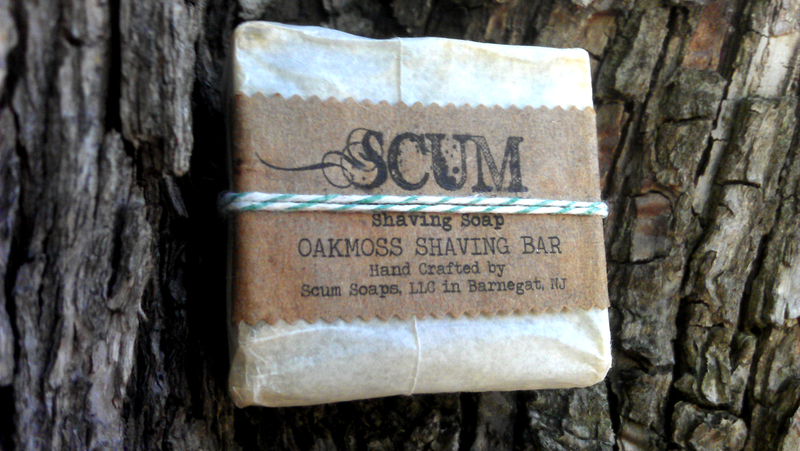 Tagged handmade men, in gear, review, Scum, Scum Soaps, Shaving Bar, shaving soap. Bookmark the permalink. Using Oakmoss shaving bar for over a year, Smell is awesome and the lather is very rich, bar lasts a long time and leaves my face very smooth. You will definetly enjoy this bar. It’s great! Agree with all of the above.